Republicans in the House and Senate are completely deferential to President Donald Trump in public. But in private, many are concerned about his baffling decisions. And nowhere is that on better display than in a new report from the Washington Post on the recent summit in Munich, where American officials were met with both silence and ridicule. According to the Washington Post, congressional Republicans were livid with acting defense secretary Patrick Shanahan. Sen. Lindsey O. Graham (R-S.C.), the leader of the main congressional delegation, pressed Shanahan on whether he was telling European officials in Munich that the full U.S. withdrawal from Syria was a done deal. “Are you telling our allies that we are going to go to zero by April 30?” he asked Shanahan, according to Graham. “Yes, that’s been our direction [from the president],” Shanahan replied. “That’s the dumbest f---ing idea I’ve ever heard,” Graham responded. The report from the Washington Post doesn’t include photos from the meeting between U.S. congressional leaders and Shanahan in Munich. I’ve included those photos here, despite the fact that they were released by Shanahan’s own public affairs office. 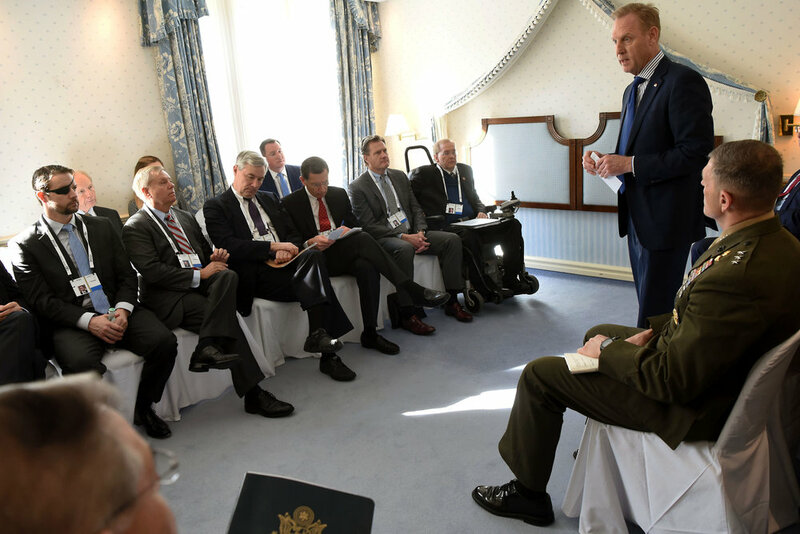 Inside the meeting, after Graham confronted Shanahan, several other lawmakers from both parties chimed in, warning Shanahan of what they believed were the risks of Trump’s Syria withdrawal plan. They implored Shanahan to persuade the president to change course. Several lawmakers told me Shanahan stood silent, like a “deer in the headlights.” They said he failed to articulate a substantive response — other than to reiterate these were Trump’s instructions. Menendez said the Europeans likely won’t commit any new troops to Syria until or unless Trump commits to leaving some U.S. troops there first. Sen. Sheldon Whitehouse (D-R.I.) said that if Trump does decide to leave some troops in Syria, he could get not only European help but also broad bipartisan congressional support. All of the photos on this page are in the public domain and can be used freely. 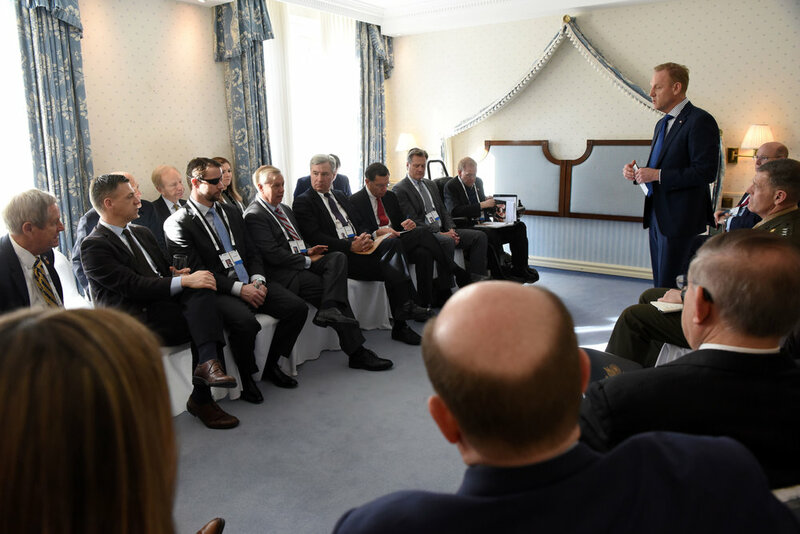 In a normal environment, the defense secretary or secretary of state would be the one leading an important U.S. policy drive at a major international conference. But this year, Secretary of State Mike Pompeo was absent following the previous “Peace and Security in the Middle East” conference in Warsaw — which many subsequently referred to as a diplomatic “dumpster fire.” There is no permanent defense secretary, and Shanahan does not have the mandate nor the intention to make policy. U.S. Secretary of State Mike Pompeo delivered remarks about the crisis in Venezuela at the United Nations in New York City on January 26, 2019. “Now it is time for every other nation to pick a side. No more delays, no more games. Either you stand with the forces of freedom, or you’re in league with Maduro and his mayhem,” Pompeo said to the UN Security Council during an emergency session on Saturday, January 26, 2019. Pompeo took a limited number of questions from the media after the meeting. Video and a transcript from that exchange is available here and is free to use without further permission. The video can be viewed on YouTube and both viewed and downloaded at Archive.org. The full transcript of the exchange is below. SECRETARY POMPEO: Good morning. The United States is very proud that we had a long overdue meeting here of the UN Security Council today and we are equally proud to stand with the Venezuelan people as they protest and restore democracy in their nation. Former President Maduro’s socialist experiment has ruined a once proud nation, as I said earlier, and we’re – we stand with the Venezuelan people to restore democracy and return that country to its rightful condition. Got a whole nation starving, massive malnutrition, refugees fleeing. This is an international crisis to be sure. And nations like Cuba and Russia and China have shamefully cast their lot in support of the former president. They don’t have the best interests of the Venezuelan people at heart. We hope that every nation will join us in recognizing interim president Juan Guaido. We hope too that each of those nations will ensure that they disconnect their financial systems from the Maduro regime and allow the assets that belong to the Venezuelan people to go to the rightful governors of that state. We hope too that this peaceful transition can continue. We must stand for the rule of law and support the leader who the Venezuelan people have affirmed through their constitution as the interim president of their country. MR PALLADINO: Reuters, Michelle Nichols. QUESTION: Thank you, Mr. Secretary. Michelle Nichols from Reuters. Couple of questions. First of all, in there the Russian ambassador had a very direct question for you about the U.S. taking military action. If you’d like to answer that here, feel free. What economic measures does the U.S. plan to impose on Venezuela? And do you think the Venezuelan opposition should assume the UN seat here, and does the U.S. plan to draft a General Assembly resolution to make that happen? SECRETARY POMPEO: Michelle, let me take two of those three questions. First, this is the first step of what we hope will be real progress here at the United Nations. We think every member of the United Nations ought to join in support of Venezuelan people, so we will continue to work to get more and more support. We’re already a great deal along the way and we do think that there will be appropriate resolutions when the time is right, and we’ll certainly support those. They won’t come just from us, they’ll come from other nations who care deeply about the Venezuelan people as well. The other two questions involve what the United States will do next. I’m not going to speculate or hypothesize. I know only this: we’re determined to support the Venezuelan people so that they can ultimately have the democratic institutions they deserve and they can return this once vibrant, wealthy, wonderful nation to its rightful place. MR PALLADINO: Voice of America. Voice of America, Celia Mendoza. QUESTION: Thank you. Thank you, Secretary. So what exactly are you prepared to do for the Venezuelan people? You had announced the $20 million in humanitarian aid, and also today you said something in your speech: it is “time for every nation to pick a side.” Will the U.S. consider secondary sanctions against countries who recognize the Maduro regime, like Washington did in Iran? SECRETARY POMPEO: So the United States has already done a great deal for the Venezuelan people. We will continue to do that. You mentioned the initial monies, $20 million, to ensure that food and medicine and we can get some level of order to begin to be restored. There’ll be much more to do. We’ll call upon other nations. We will join with them to create development and humanitarian assistance projects that actually deliver for the Venezuelan people. Those are all part of what will come when we get the democratic changes that we’re working towards achieving. You had a second question too? SECRETARY POMPEO: Yeah, again, I’m not going to speculate on what other processes the United States might undertake, but know that we think now that the National Assembly is the rightful governing body. They’ve chose interim President Juan Guaido to represent them and so we think that the resources that belong to the Venezuelan people ought to go to the leaders that they have under their constitution duly elected. QUESTION: Sanction anybody that will do business with them? SECRETARY POMPEO: I’m not going to speculate on what we’re going to do next. MR PALLADINO: (Inaudible) final question. Associated Press, Edith Lederer, please. Edith? QUESTION: Okay, thank you. Thank you. Mr. Secretary – Mr. Secretary, it’s Pamela Falk from CBS. How concerned are you about the military-to-military contact between Russia and the deliveries of equipment last month to Venezuela, and have you had any contact with the military of Venezuela? Thank you. SECRETARY POMPEO: So I spoke this morning about Cuban security and Russian influence, Russian interference. We want the Venezuelan people to have their say. And so the Russians have chosen to support the Maduro regime, I hope they’ll change their way, I hope they will come to see that the rightful people to run this country are those that the Venezuelan people chose. And so we’ll have conversations with every country, including the Russians. We’ll talk with the Chinese, we’ll talk with everyone. We think the whole world ought to get behind what it is that the Venezuelan people have demanded for their country. 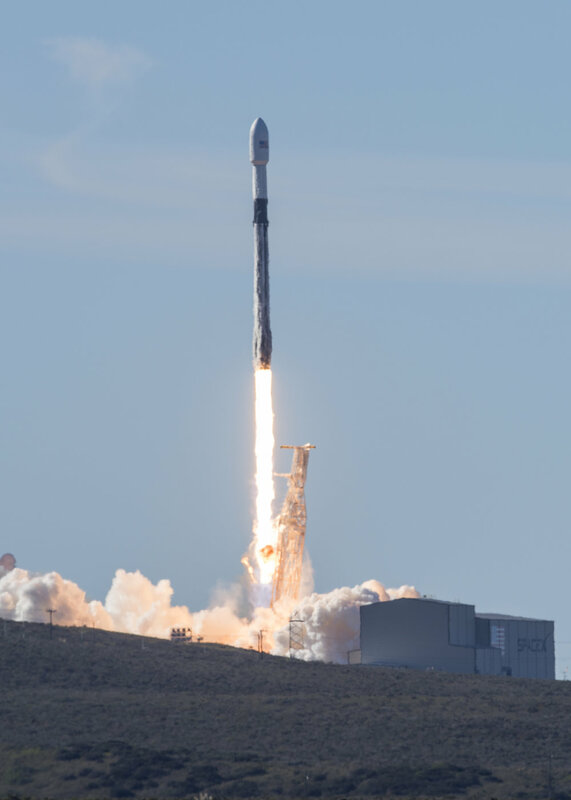 On December 3, 2018, a SpaceX Falcon 9 rocket carrying the Spaceflight SSO-A SmallSat Express was launched from Vandenberg Air Force Base in California. 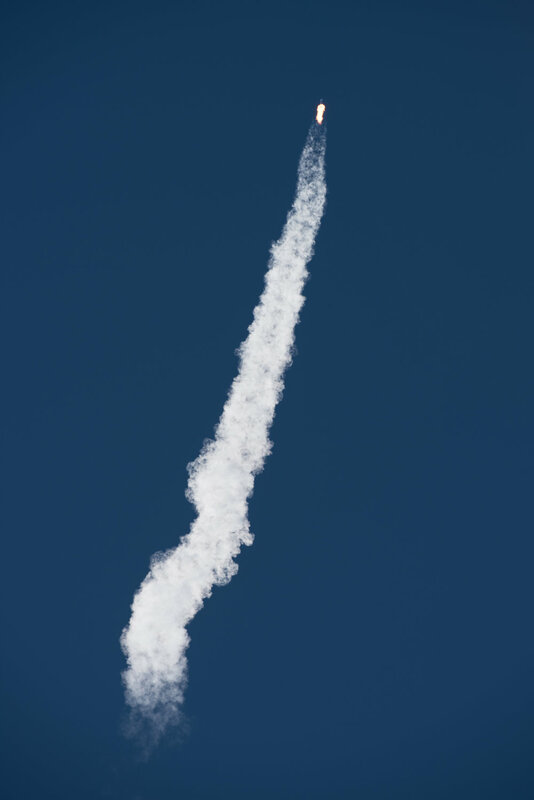 The launch took place at 10:34am PT/1:34pm ET and was successful. The photos and video below are all in the public domain and can be used without permission. Below are photos and videos of George H.W. Bush who died on November 30, 2018 at the age of 94. 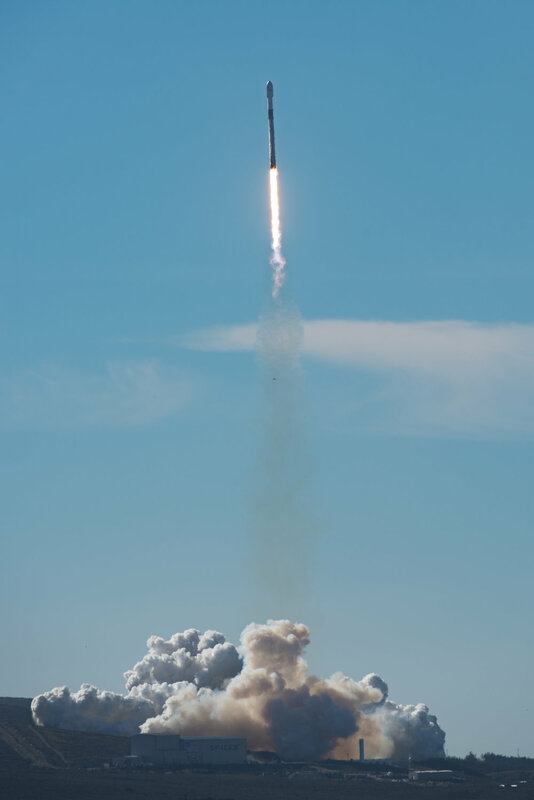 All of the photos are in the public domain and can be used freely without further permission. All of the descriptions come from the Defense Visual Information Distribution Service (DVIDS). President George H.W. 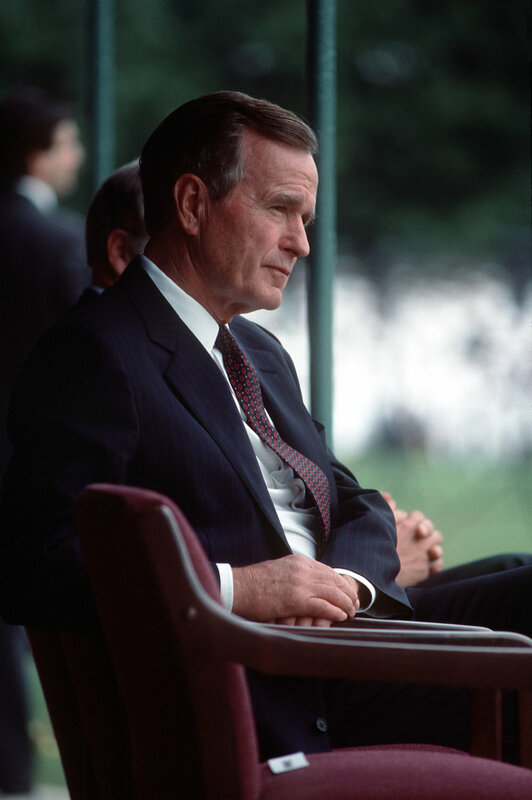 Bush listens to a speech during the retirement ceremony for Admiral William J. Crowe Jr., chairman, Joint Chiefs of Staff. The ceremony is being held at the US Naval Academy in Annapolis. Former President George H.W. 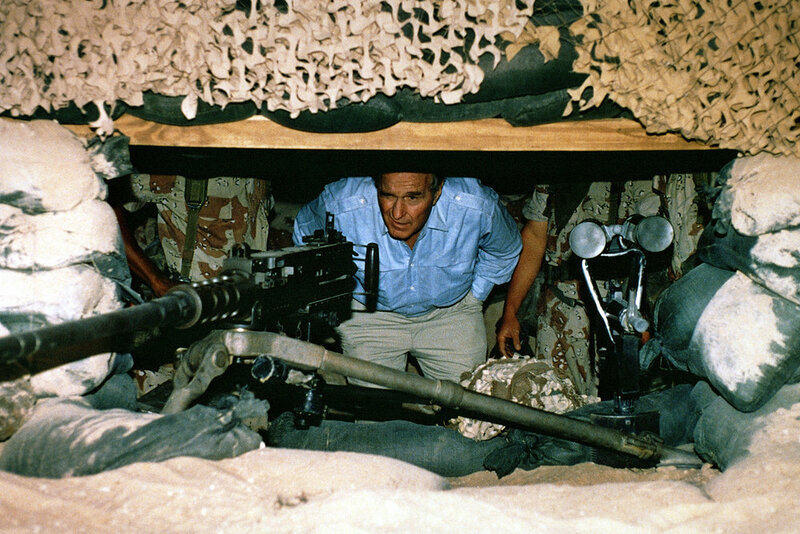 Bush speaks to sailors via the ship's announcing system aboard the aircraft carrier that bears his name, USS George H.W. Bush (CVN 77). 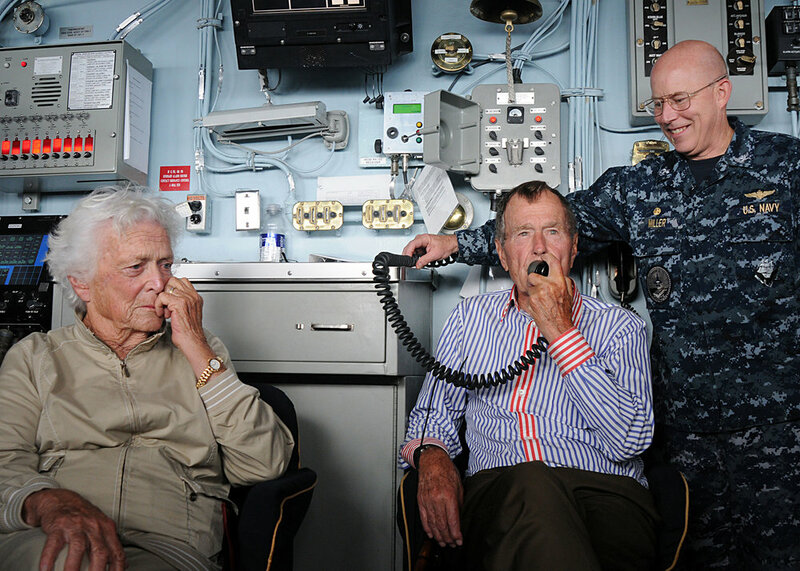 Bush and his wife, Barbara, spent their time aboard watching flight operations, touring the ship and visiting with the crew. George H.W. Bush is conducting training in the Atlantic Ocean. President George H.W. 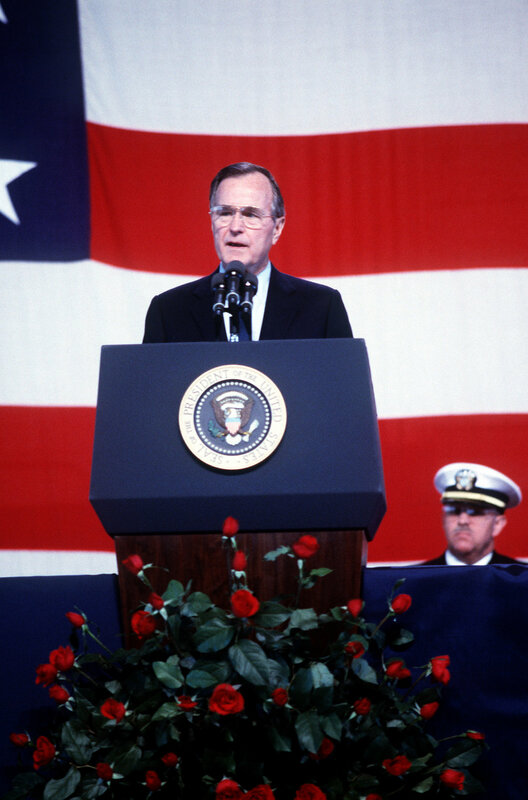 Bush speaks during a memorial service for 47 crew members killed in an explosion aboard the battleship USS Iowa (BB-61). The explosion occurred in the No. 2 16-inch gun turret as the Iowa was conducting routine gunnery exercises approximately 300 miles northeast of Puerto Rico on April 19th. President Donald Trump has deployed over 5,000 troops to the U.S.-Mexico border as he complains about the so-called “invasion” happening there. And in new comments from Mar-a-Lago, Trump says that not only have troops be authorized to use lethal force (something expressly forbidden by the Posse Comitatus Act within the borders of the country), he’s now threatening to shut down the border completely if he doesn’t get what he wants. You can watch video of President Trump’s threats on November 22, 2018 at Archive.org and on YouTube. 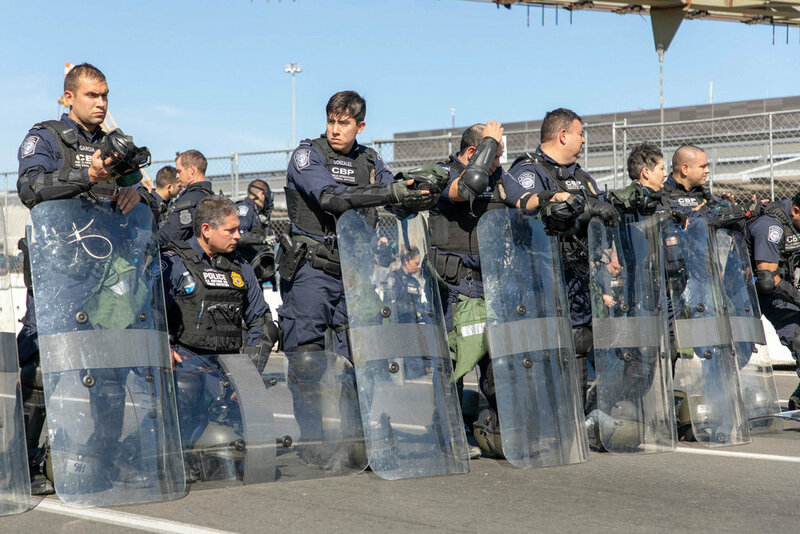 Photos from the U.S-Mexico border on November 22, 2018 are below. They were all created by the U.S. Customs and Border Protection Office of Public Affairs and are therefore in the public domain because they were taken by the federal government. All descriptions below are also authored by the U.S. government. Feel free to use the photos however you like without further permission. 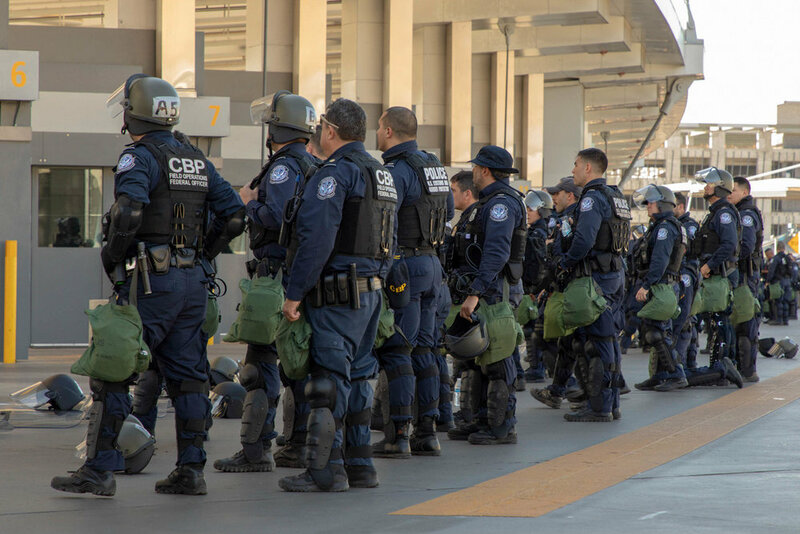 CBP officers from the Office of Field Operations, and agents from the U.S. Border Patrol and Air and Marine Operations execute a planned readiness exercise at the San Ysidro Port of Entry. 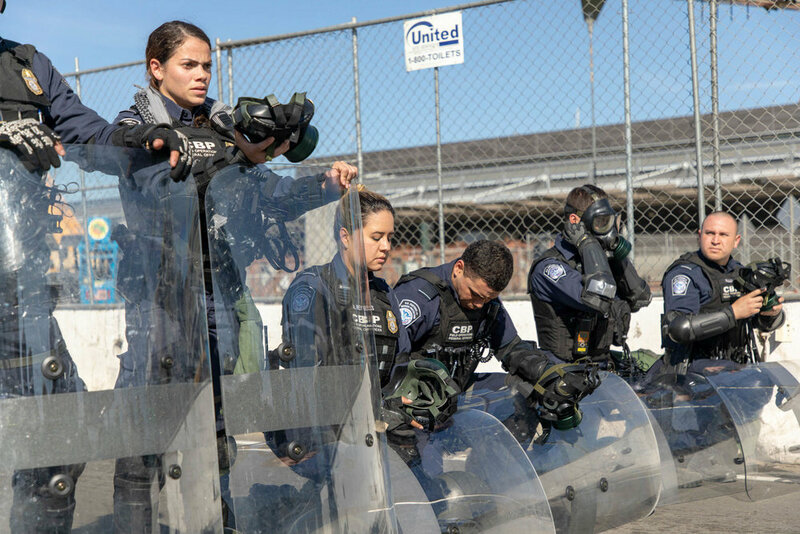 The exercise is designed to evaluate readiness and assess the capabilities of CBP facilities to make necessary preparations. November 22, 2018. CBP photo by SCBPO Luis Angulo. 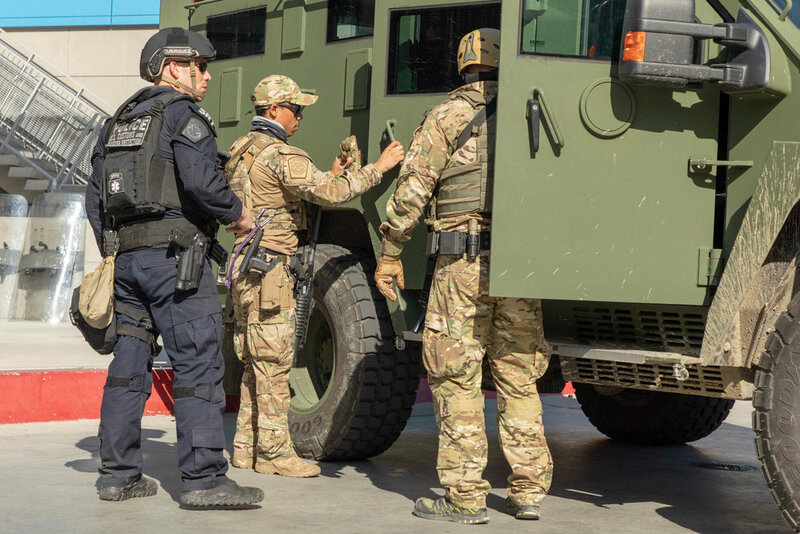 CBP officers from the Office of Field Operations, and agents from the U.S. Border Patrol and Air and Marine Operations execute a planned readiness exercise at the San Ysidro Port of Entry. The exercise is designed to evaluate readiness and assess the capabilities of CBP facilities to make necessary preparations. November 22, 2018. CBP photo by Shawn Moore. 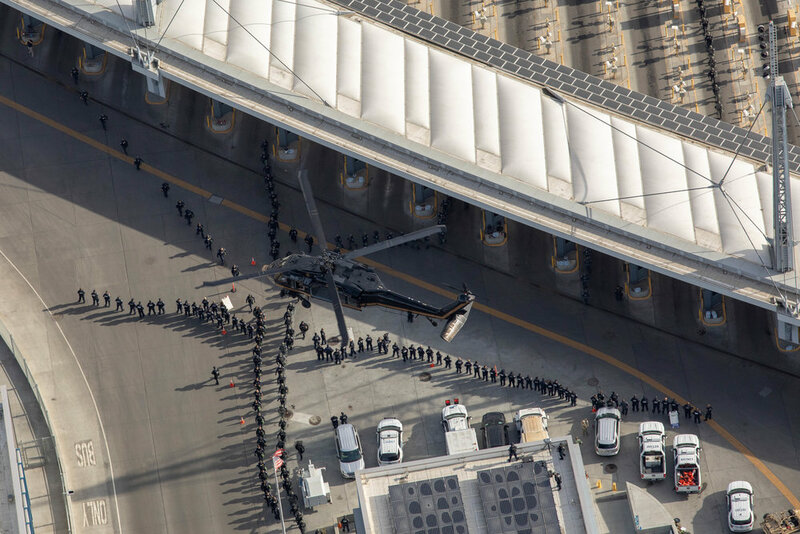 A CBP Air and Marine Operations Black Hawk Helicopter passes over the San Ysidro Port of Entry during a planned readiness exercise at the port. 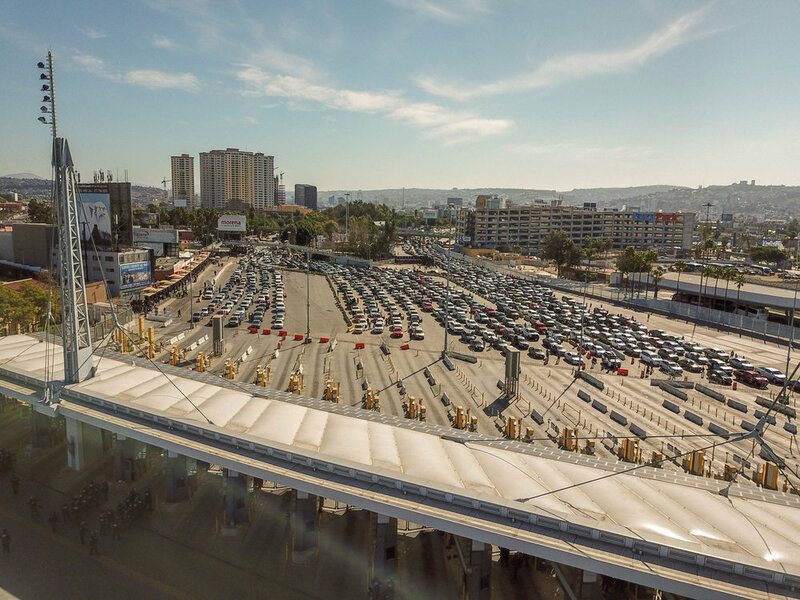 The exercise is designed to evaluate readiness and assess the capabilities of CBP facilities to make necessary preparations. November 22, 2018. 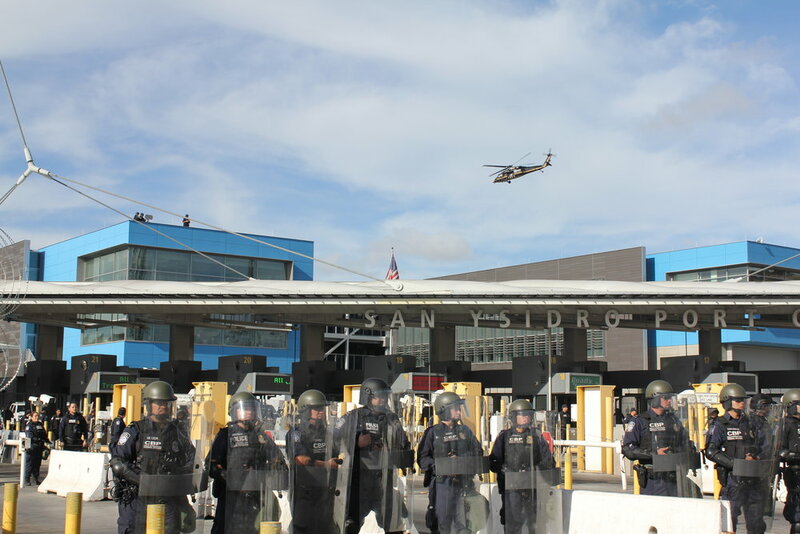 CBP photo by SCBPO Luis Angulo. 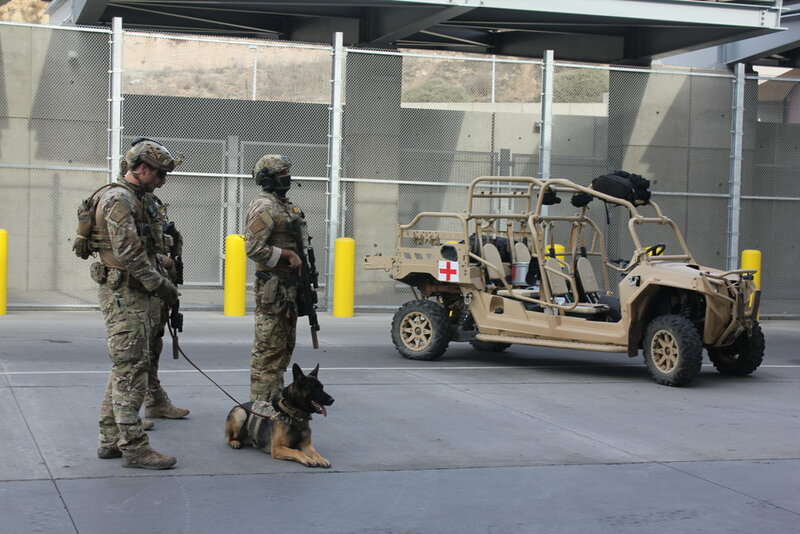 A CBP Air and Marine Operations Black Hawk watches over the San Ysidro Port of Entry during a planned readiness exercise. The exercise is designed to evaluate readiness and assess the capabilities of CBP facilities to make necessary preparations. November 22, 2018. CBP photo by SCBPO Luis Angulo. 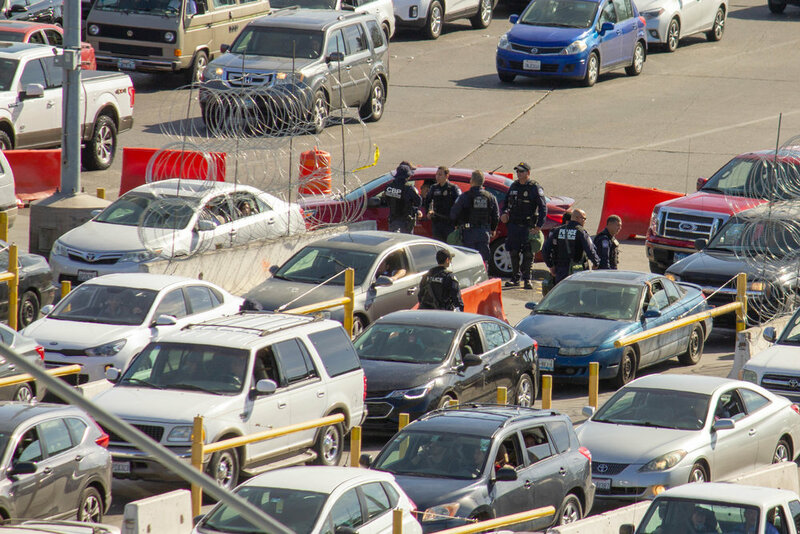 CBP employees from Office of Field Operations, the U.S. Border Patrol, and Air and Marine Operations execute a planned readiness exercise at the San Ysidro Port of Entry. The exercise is designed to evaluate readiness and assess the capabilities of CBP facilities to make necessary preparations. November 22, 2018. Photo by Mani Albrecht. Caption from CBP: "Construction workers assemble panels with concrete drying in the construction of the new border wall in the Chula Vista Area of Responsibility, California. June 19, 2018. Seen here are assembled panels with concrete drying." On July 13, 2018 U.S. Customs and Border Protection (CBP) released nine photos from June 19, 2018 that purport to show "new border wall construction." 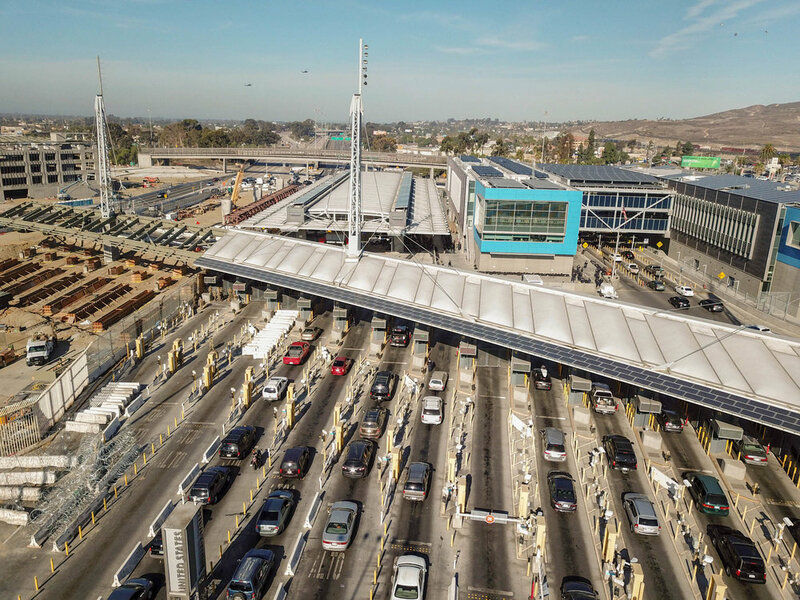 The US-Mexico border wall construction is reportedly happening near the "Chula Vista Area of Responsibility," despite the fact that Chula Vista, California's city limits do not touch the US-Mexico border. These photos are in the public domain and can be used without restriction. Photos should be credited to CBP and Tim Tucciarone. Notably, Mexico hasn't paid a dime for "the wall." Caption from CBP: "Construction workers putting up new wall at the border located at the Chula Vista Area of Responsibility, California, on June 19, 2018. Seen here construction workers are assembling the new wall panels onsite." 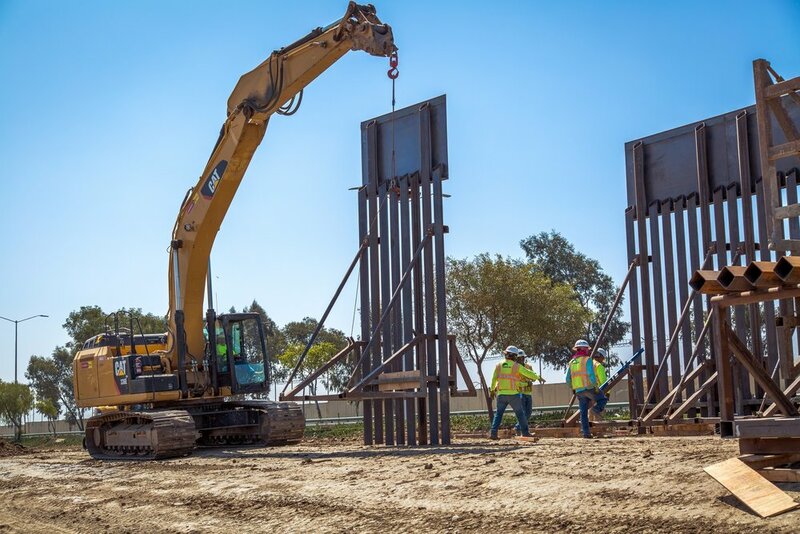 Caption from CBP: "Construction workers putting up new wall at the border located at the Chula Vista Area of Responsibility, California, on June 19, 2018." Caption from CBP: "Construction workers putting up new wall at the border located at the Chula Vista Area of Responsibility, California, on June 19, 2018. Seen here from the East the ground is being prepared for trenching by construction workers." Caption from CBP: "Construction workers putting up new wall at the border located at the Chula Vista Area of Responsibility, California, on June 19, 2018. Seen here from the West is the trench with new panels in the background." Caption by CBP: "Construction workers putting up new wall at the border located at the Chula Vista Area of Responsibility, California, on June 19, 2018. Seen here is new and old wall to the East." Caption from CBP: "Construction workers putting up new wall at the border located at the Chula Vista Area of Responsibility, California, on June 19, 2018. Seen here is the placement of a new border wall panel." Caption from CBP: "Construction workers putting up new wall at the border located at the Chula Vista Area of Responsibility, California, on June 19, 2018. Seen here are scrap pieces of the old border fence."